At about 1000 times larger in volume compared to Earth, Jupiter is the largest planet in our solar system. In fact, if Jupiter was 50 times larger than it is now, it would be a star on its own. And if you combined all the planets in the solar system, it still wouldn’t be as big as Jupiter. Other than its tremendous size, Jupiter has tons more superlatives. What are some other facts about Jupiter? Jupiter spins at an incredible pace. The velocity at Jupiter’s equator is about 28,000 miles per hour, compared to Earth’s 1000 mph. This means that one day on Jupiter takes a bit less than 10 hours. Because of its fast rotation and heaping size, the coriolis effect is extraordinary in size. Jupiter’s weather is so extreme that we can see it from space. For example, astronomers have observed an everlasting hurricane ever since we’ve first seen it. 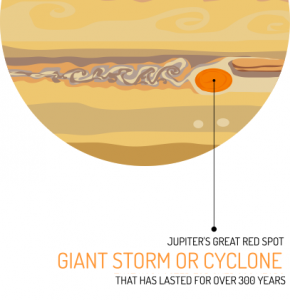 We see this enormous cyclone as a red spot on it because of the Coriolis effect. Also, the Coriolis effect gives Jupiter its banded appearance. The aurora borealis isn’t unique to Earth. Jupiter has a similar display of lights but of much greater size in comparison. Electrically charged particles in the magnetosphere and solar radiation from the sun create a magnificent display of aurora borealis on Earth. 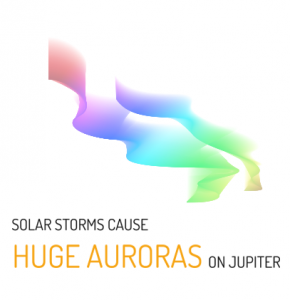 Similarly, solar storms cause huge auroras on Jupiter. But they glow much brighter than Earth because Jupiter’s tremendous size gives it more electrical potential. It’s believed that Jupiter has 79 moons. Only 53 of the moons have names and 26 are awaiting for names. They were all formed with rock and metal like terrestrial planets but also water, ammonia and methane. One of them even has potential to harbor life beneath its ice covered crust. As of 2018, astronomers discovered 12 new moons increasing the total to 91. This includes one oddball moon that circles Jupiter in the opposite direction as the others. Jupiter’s moon “Io” is the most volcanic place in our solar system. It’s constantly erupting liquid basalt and sulfur making it the most geologically active body in the solar system. 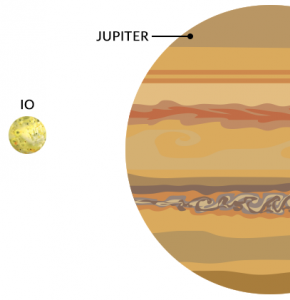 Io is best known for its yellow appearance. This is because of all the volcanic activity present on it. It’s not only color but its scent would be absolutely pungent. If you were to set foot on Io, the smell would be unbearable due to the sulfur. It’s the because you have tidal heating from Jupiter stretching and compressing creating molten rock. We never expect life to exist on gas giants because they don’t have a surface. 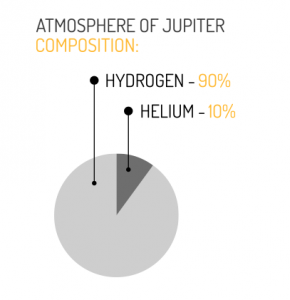 In addition, they are mostly just hydrogen and helium. Europa is made of iron rock. It has salt water ocean beneath a thin frozen icy crust. Its water level is about 100 km thick and its ice layer is maybe about 10 to 30 km. 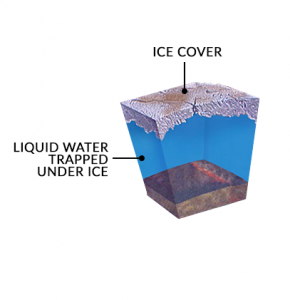 When the ice crust layer cracks, water fills the cracks. It’s the heat that drives this process from tidal forces of Jupiter. Because Europa has liquid water at its surface, it’s one of the only places in the solar system where life could possibly exist. 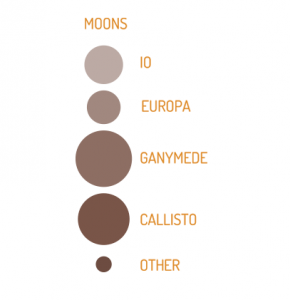 Ganymede is so large that it’s the 9th largest object in our solar system. In fact, it’s larger than both Mercury and Pluto. So if Ganymede orbited the sun, that would make it a planet of its own. Ganymede is made of rock and mantle with an icy crust. The crust on Ganymede is old. It has old impact craters with an induced magnetic field. Callisto is about size of planet Mercury. It’s the most heavily cratered object in our solar system. It’s the second largest moon of Jupiter and is third largest moon in our solar system. It’s composed of half rock and ice. There’s potential that it could have deep liquid oceans. It doesn’t have significant tidal heating and is less affected by Jupiter’s magnetosphere. The reality is that Jupiter is a raging ball of hydrogen and helium without a solid surface. Out of all the planets in the solar system, Jupiter formed first pulling in available gasses. For Earth, any hydrogen and helium atom flies out of space because we’re not big enough to hold onto it. But bigger planets like Jupiter, Saturn, Uranus are able to hold onto hydrogen and helium. Unlike Earth, Jupiter had held onto its original composition. This is because Jupiter’s gravity is large enough to hold onto light gases like hydrogen and helium. This way, we can get a sneak peak of our early solar system. This gravity tug-of-war between the two behemoths puts Mercury, Venus, Mars, Earth and an asteroid belt smack dab in the middle. Neither side wins so all these objects remain in between. The distance between Jupiter and the sun is about 5.2 AU. That’s about 778 million kilometers of tug-of-war. Finally, NASA has a list of facts about Jupiter. 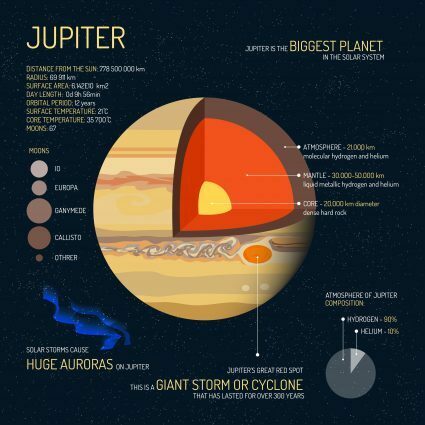 Here are some quick facts about the gas giant. Jupiter goes through one day in only 10 hours. It has an orbital period of about 12 years. The length of a day on Jupiter is 9 hours and 56 minutes. The distance from the sun to Jupiter is about 778,500,000 km. Its surface area is about 61.42 km2. 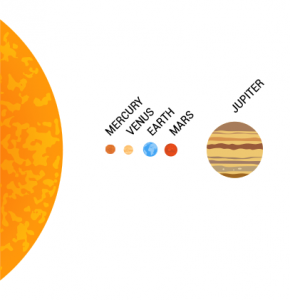 In terms of mass, gas giants like Jupiter dwarfs Earth. The colossal heavyweight Jupiter radius is nearly 70,000 km compared to Earth’s measly 6,371 km. It’s the 5th planet from sun. Galileo mission was the first to orbit Jupiter. The name Jupiter originates from Roman and Greek mythology. Jupiter created clouds to hide himself. It was Juno, his wife, who could veer through the clouds to see what Jupiter was up to. Galileo viewed Jupiter from his telescope invention more than 400 years ago. Jupiter is covered by clouds of gas which are poisonous to us.